At the Lab we train hard and train smart. We focus on mechanics, consistency and intensity. Fitness in our perspective is the ability to perform a task. Whether that’s to run a half marathon, complete a triathlon, simply lose weight or just be a better version of yourself. Our program we will give you a foundation that enables you to reach all your goals. You are what you repeatedly do. You are not what you do occasionally. We challenge you to be consistent. The single most important thing humans can do for their health is exercise regularly. 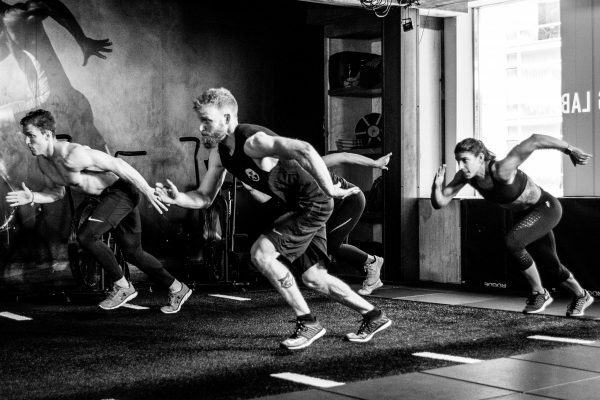 Our training day class is approximately 55 minutes of high intensity, total body workout, which will also have a barbell movement to it. We add a teamwork element to the class as much as possible, along with our staple calisthenics workout with cadence. Movements incorporated in class are sprints on our turf, jumps, pushing and pulling sleds and TRX. There are also dumb bells, kettle bells and battle ropes along with many other accessory items that we may incorporate into a circuit. Our Mobility Class is for everyone. This class is designed to release joint restrictions and increase your range of motion. The Mobility class technique focuses on including Isometric & PNF stretching, joint mobility, and more without injury or stress to the body. Participants learn how to connect their unique anatomy and biomechanics to improve range of motion, skill, and function. Experience huge progress without risking injury– clients leave class feeling lengthened with more range of motion. For those that would prefer one on one specialized training. We offer result driven customized one on one training with the best in the industry. Our training team comes from a varied background of athletic competition, training and coaching. Our team combines years of practical experience and the latest in sports science research to help you reach your goals.